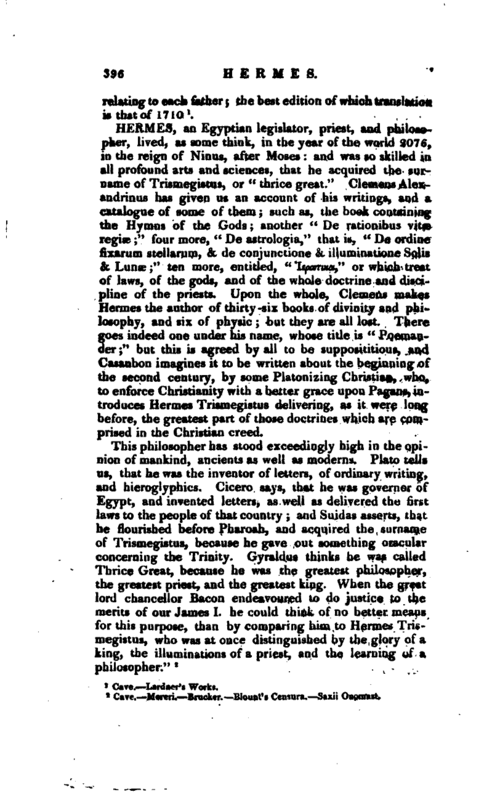 , an Egyptian legislator, priest, and philosopher, lived, as some think, in the year of the world 2076, in the reign of Ninus, after Moses: and was so skilled in all profound arts and sciences, that he acquired the surname of Trismegistus, or “thrice great.” Clemens Alexandrinus has given us an account of his writings, and a catalogue of some of them such as, the book containing the Hymns of the Gods another “De rationibus vitae regiae” four mo*e, “De astrologia,” that is, “De ordine fixarunl stellarum, & de conjunctione & illuminatione Solis & Lunae” ten more, entitled, “lE^arwa,‘’ or which treat of laws, of the gods, and of the whole doctrine and discipline of the priests. Upon the whole, Clemens makes Hermes the author of thirty -six books of divinity and philosophy, and six of physic; but they are all lost. 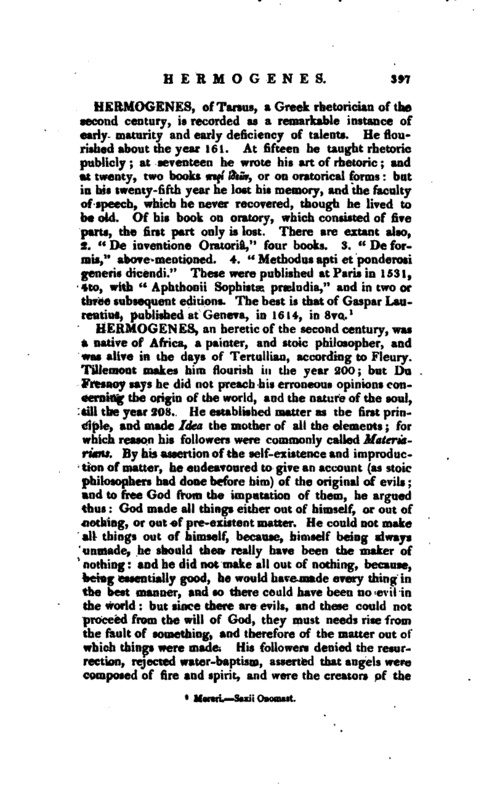 There goes indeed one under his name, whose title is” Poemander;" but this is agreed by all to be supposititious, and Casaubon imagines it to be written about the beginning of the second century, by some Platonizing Christian, who, to enforce Christianity with a better grace upon Pagans, introduces Hermes Trismegistus delivering, as it were long before, the greatest part of those doctrines which are comprised in the Christian creed. Cave. —Moreri.-Brneker. Blount’s Censura. —Saxii Onomast.